Add sweet potato to a bowl and mix well until it’s pretty smooth, then add in the whisked eggs, coconut oil, coconut flour, baking powder and mix well. Add any sweet ingredients and mix well. 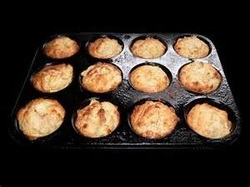 Notes: Coconut flour is very dense and absorbs liquids quickly making the batter dry and difficult to pour. I find sometimes you have to adjust the ingredients a bit to have some more moisture in the batter. I often add a touch of egg white. Feel free to play around with the recipe a bit until you find the combination that works for you.